This year long series looks at the experiences of teachers, parents, students, and Montessori education itself, as we follow a student through his first year at a Montessori Preschool. The Montessori Insights and Reflections of a Preschool Student’s First Year is a collection of useful stories, tips, and information that has arisen from one real student's Montessori journey, viewed through the eyes of his Montessori Teacher, Bree Von Nes. Toddlers and tantrums tend to go hand in hand, and it is important to remember that this phase will pass. A temper tantrum is usually a result of the child not being able to effectively express himself verbally, which leads to intense frustration. I have had young Montessori students over the years who battle with temper tantrums; it can be a helpless feeling for the Montessori teacher at times, especially when you feel like you have tried everything! I have found that the more consistent you can be, the quicker the phase passes. It is vital to figure out what works for the individual child. Here are a few examples to give you some further insight into different situations and how they may be handled by the Montessori teacher. As is often suggested for positive discipline, offering limited choices in a positive way can be effective. One little girl falls apart if someone looks at her the wrong way but she settles right down if she is able to regroup in the reading corner with a book and the reading teddy. A little boy falls to the floor every time he is reminded to tuck in his chair or roll up his mat, however, the quieter I say it, the better he responds. If I speak to him in almost a whisper, he is more than happy to go back and tuck his chair or roll his mat - I think he feels less threatened when the request is made in a very subtle, soft manner. It is important not to “buy into” the tantrum… a little boy who just turned three throws a fit constantly, no matter how you phrase your request … he crosses his arms, stomps his feet and makes a noisy huff over and over again. For this young student, it works to look him in the eye, acknowledge that he is feeling frustrated and give him the choice of talking to me with his words or taking a few minutes to calm down by sitting in his cubby. He almost always chooses to sit in his cubby and when he feels ready, we then talk about the situation and I help him deal with whatever it is that is upsetting him. That few minutes to regroup are huge for him! Temper tantrums are usually dramatic, intense and full of emotion. With a calm demeanor, patience and persistence, you can almost always help diffuse the drama of a temper tantrum and change the situation to a calm, quiet discussion. It is important to stay calm, keep control and maintain peace. Maintain a consistent routine ... the more predictable your routine is, the easier it is for a child who is prone to temper tantrums. Provide a warning before transitions. I have two little girls who really struggle with transition times, so I always give them a quiet warning several minutes ahead of time and it works beautifully. For example, “I am going to turn the music on in five minutes for clean up time, so you have five more minutes to continue working.” If I forget the warning, they fall apart! Observe and be in tune with escalating frustration levels ... intervene before the tantrum occurs. Distractions and redirections work wonders with little ones. Try to avoid the word, ‘no’ as it adds to a toddler’s frustration. Instead, use phrases like ‘later’ or ‘after lunch’. Be aware of stressors that may require extra empathy (toilet training, starting daycare, etc). A little empathy goes a long way when a child is feeling overwhelmed and frustrated. 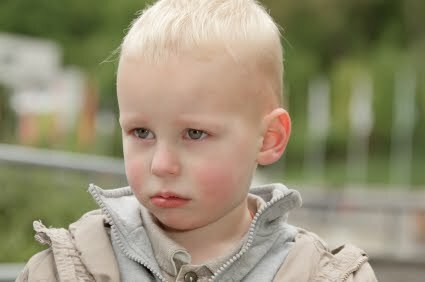 Respect and acknowledge the child’s feelings, “I know you are feeling angry………, That must have made you feel really sad when…….” When children receive verbal assurance that their feelings are important and acknowledged, they gradually learn to put those feelings into words instead of acting out. Most children do grow out of the need for tantrums when they have more language skills and understanding. But the way you deal with them in the toddler years is important. If they are handled harshly, or if you constantly ignore a child’s feelings and need for comfort, they may well become worse and carry on for a much longer period of time. A great reading resource for all Montessori educators is “Children Who Are Not Yet Peaceful”, by Donna Goertz. The NAMC Infant/Toddler (0-3) Classroom Guide also provides tips and tools for curriculum preparation, classroom management, communicating with young children, and more. © North American Montessori Center - originally posted in its entirety at Montessori Teacher Training on Thursday, October 7, 2010.